¡Mil gracias! A thousand thank you’s for making Noche de Periodistas a huge success. We exceeded our ticket sale goal. This was very important since we make most of our money from the ticket sales. We brought in $3,045. *$560 will go to the National Association. We split the United Airline Ticket proceeds 70/30 with the National Association. Our chapter keeps 30%. To everyone who bought a ticket, brought food, beer, wine, and paper plates: Thank you! Our chapter fundraiser was a success because of you. 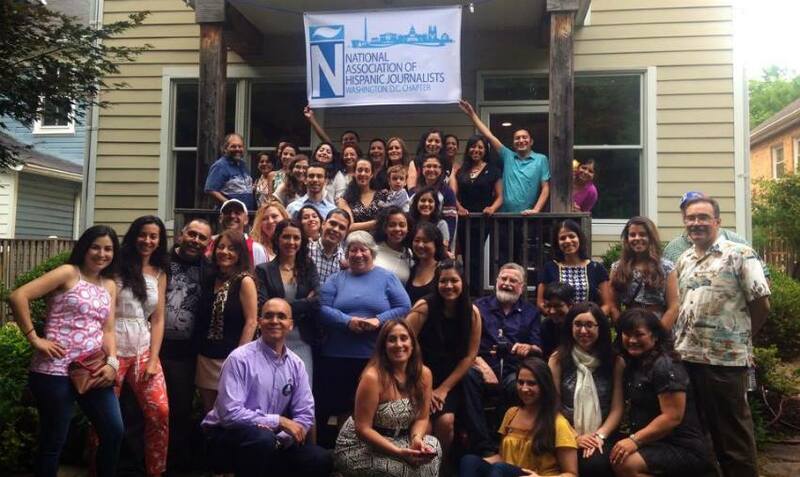 We want to thank our special guests: NAHJ founder Charlie Ericksen from Hispanic Link, D.C. Shadow Senator Michael D. Brown (D), and Republican Strategist Sergio Rodriguera, Jr.
We appreciate the D.C. Chapter Presidents from AAJA, Seung-Min Kim, SPJ, Elizabeth Jia, and WABJ, Donna Walker for coming. UNITY JOURNALISTS Executive Director Roberto Quinones also stopped by. A big thank you to Ray Suarez and his wife Carol for hosting our 3rd annual chapter fundraiser at their home. Thanks NAHJ Region 3 Representative Felix Contreras for donating his musical talents for our chapter also for a third time. Felix and his Cilantro Boogie Brothers were amazing. As always our chapter is so successful because of members like you.